To access your Projects Dashboard, on the top navigation bar, click . The Projects Dashboard shows an overview for all the projects in which you are involved: what you are working on, what you are watching and a short list with projects. From the Projects Dashboard, to navigate to any Project, click its name; to navigate to any User Story, Task or Issue, click subject. To go to the My Projects page and view the full list with the projects in which you are involved, on the Projects Dashboard, under the short list with projects, click MANAGE PROJECTS or, on the top navigation bar, click . If you just hover your pointer over on the top navigation bar, you can see quick links to your top 10 projects as well as the buttons for creating a new project and for importing a project – for more details about those two buttons, you can go to Creating a project. 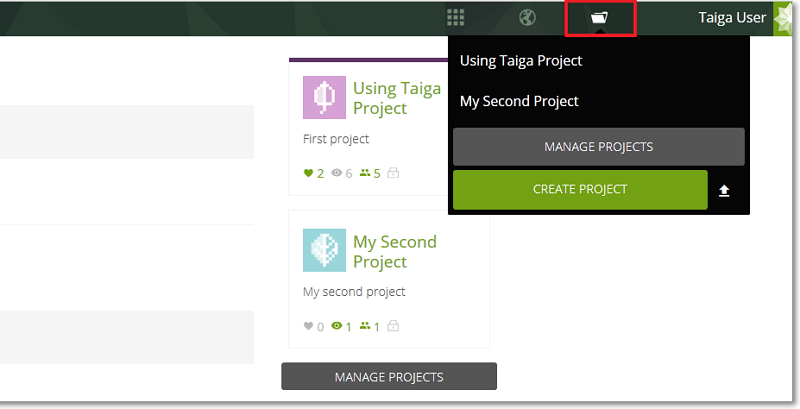 Note: To learn more about how to create a project in Taiga, you can go to Creating a project.